You can also help us! Employing visually impaired persons, not out of sympathy but on merit of their skill and output. Contact or visit us for a spot assessment of our trainees. Our placement officer can also get in touch with you. In many jobs blindness is no handicap. A visually impaired worker's output is equal to - and sometimes more than-that of a sighted person. Give us the opportunity to see whether there is any work for the visually impaired person in your firm where the visually impaired can compete on equal terms with the sighted staff. (Contact Persons: Mr.A.David, Project Officer (mob: 9953494419) or Mr.Tejendra Singh - Placement Cell (mob:7428321155). Visit us and/or contact us to discuss more on how you could help the visually impaired. All contributions to The Blind Relief Association, Delhi are exempt from Income Tax under Section 80 G of the IT Act. Contributions from within India can be made in the name of The Blind Relief Association, Delhi by Demand Draft or Multicity Cheque and may be sent by registered or speed post to our address. In the event you wish to send your contribution through direct bank transfer please advise us through e-mail your name, address and PAN details. This will enable us to send you our official receipt without delay. For sending funds from abroad please write to us and use the following details. 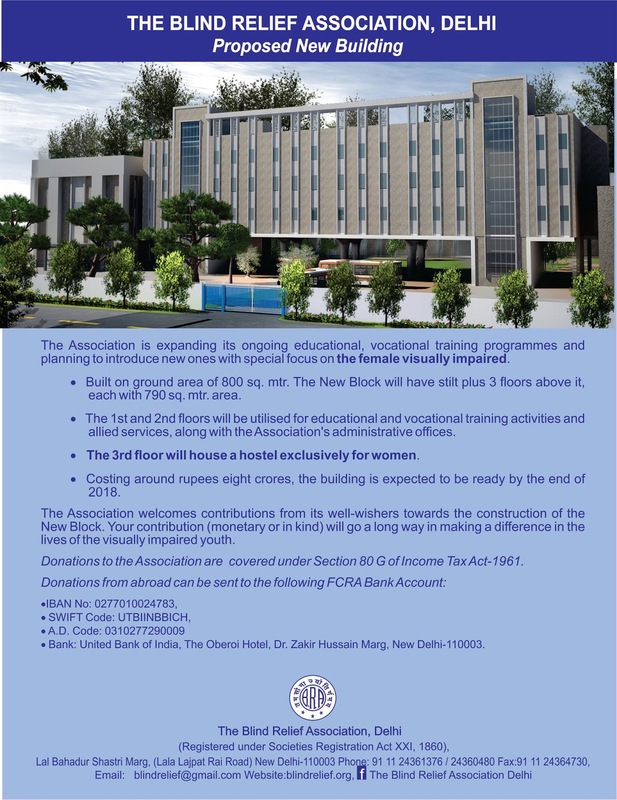 · The Department of Education, Government of NCT of Delhi – Grant-in-aid for J.P.M. Sr. Sec. School for the blind. 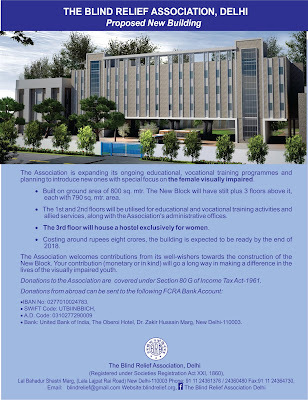 · The Department of Social Welfare, Government of NCT of Delhi – Grant-in-aid for School Hostel. · New Delhi Municipal Council – for maintenance of School. · Military Order of Collar Charitable Foundation, Switzerland - Financial support to the Association’s varied activities, namely Unit for Visually Impaired Children with Multiple Disabilities, Community Outreach Programme, Braille Production Centre and Recording Studio. · Ms. Sofia Paulsson, MOC Terra Nordica, Sweden - Financial support to the Placement Project. · The Times Eye Research Foundation and Ashok Jain Charitable Trust - Financial support to Vardhaman Jain Computer Centre for the students of J.P.M. School. · Shahnaz Husain International Beauty Academy - Supporting Ayurvedic Massage training with the free services of trainer and required consumables. Matters of Community (MOC) - is a non-profit charity organisation based in California, U.S.A. founded in 2004 by Neal Bharadwaj, a high school junior, who was inspired by volunteering experience at a resource centre in Milpitas for disabled children and their families. Through the use of music, art, theatre and sports MOC takes on projects directly with individuals as well as funds activities of other non-profit organisations that share the MOC mission. MOC’s association with the Blind Relief Association, Delhi is a story of beautiful relationship that has evolved over the last 6 years. It had a musical beginning when Neal and his brother visited the J.P.M. Sr. Sec. School in the Association and gave an enchanting clarinet recital for the School students. This first interaction led to the second visit when the two brothers jointly with the JPM students practiced and presented a music programme at the School. Upon returning to California they generated funds to support upgrading of the Music Room of JPM School. In 2004 MOC provided a donation of US $ 3000 with a matching contribution by BEBO Technologies Limited, a company own by Mr. Rajeev Rai who is a member of MOC, for acquiring Everest D V4 Braille Printer, Duxbury Braille Translation Software and a Computer for the Braille Production Unit. The new facilities have substantially strengthen the capacity to produce braille study material required by the students of JPM School as well as other visually challenged students in need of such study material. This year MOC has decided to support the dance training programme named TWINKLE for the benefit of the students of JPM School. 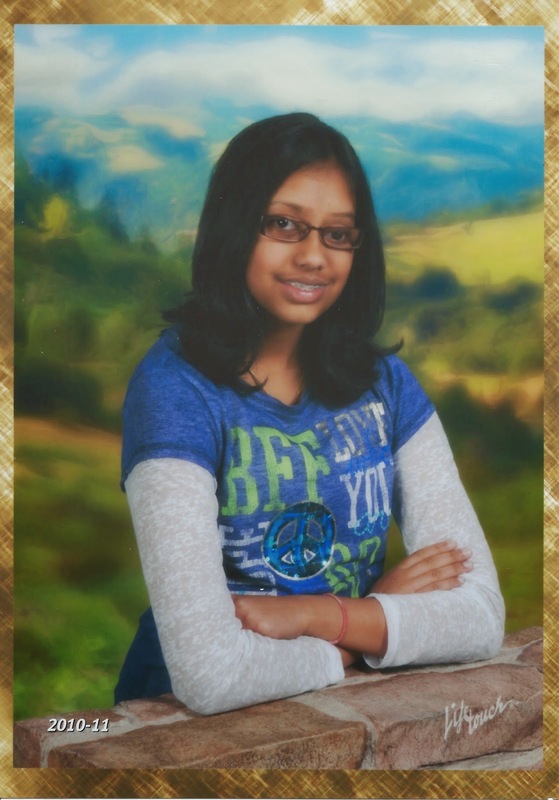 Somya Jain, a resident of San Ramon, California, is currently an 11th grade student of Dougherty Valley High School. During her summer 2012 trip to New Delhi, India, she visited the Blind Relief Association campus on Lal Bahadur Shastri Marg and was greatly inspired by the efforts of our institution. Being an avid piano player, she decided to raise money for our institution by giving piano lessons to elementary school children in her neighbourhood. Since summer 2013, Somya has raised USD $500 and donated to the Blind Relief Association.